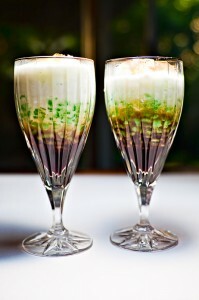 Tonight my wife made cendol which is a traditional dessert originating in Southeast Asia and very popular in Indonesia. This particular version is made with mung bean flour that was colored green from pandan leaf, coconut milk, melted palm sugar and topped with shaved ice that was drizzled with more palm sugar. Cendol can also be made with glutinous rice, red beans, grass jelly or creamed corn. I’ll admit that I was skeptical of this dessert, especially one made with red beans (which I dislike). But the truth is this is really good. It’s cold, it’s sweet and let’s face it what doesn’t taste good when coconut milk is added. On a hot day this will really hit the spot and leave you feeling refreshed. For this shot I placed the glasses on top of some old white paper and hand held a flash above the glasses. Camera settings are below.